The story of the Trojan Horse is perhaps the most famous of all the Greek myths. The Trojan War had been going on for a decade, with no end in sight and many Greek heroes dying, when Odysseus came up with an idea that won the war for the Greeks. Because the Trojans considered horses to be sacred, the Greeks built a large, hollow wooden horse. To make it even more irresistible, they used wood from Cornel trees (also sacred) to construct it. Odysseus and a group of men hid inside while the rest of the Greek army pretended to leave the area, destroying their camp and boarding their ships. After some debate as to whether the Greeks could be trusted, the Trojans dragged the giant horse inside the walls of the city. The end of the ten-year siege was a huge relief to the people of Troy, who spent the night celebrating. By midnight, everyone was in a drunken stupor. Odysseus then acted, signaling to the Greek fleet to return and leading his men out of the Trojan Horse to kill the unsuspecting guards and open the doors. The Greeks then had access to the city. They massacred the Trojans, keeping a few alive as slaves. Some of the soldiers traveled further afield, forming settlements which are supposed to have led to the creation of Rome. Ancient Greeks saw this myth as factual, with the events occurring between 1300–1200 BC in the area near Dardanelles. There is some archeological evidence for the existence of Troy, although most historians now accept that the story is mythological. There is probably still some basis in actual events, as sieges were common during that era. Myth or not, the fact that the story of the Trojan Horse has survived for over 3,000 years indicates its power and utility as a mental model. Why, exactly, has this particular story retained its grip on our imagination for so long? We can only speculate as to why. Perhaps the answer lies in the fact that the Trojan Horse is not just a story. It’s also a parable, a metaphor, an invitation to be ingenious, an example of out-of-the-box thinking. Reading it has sparked so many ideas for so many people. It is at once practical and bizarre. Using it as a mental model, we can apply the Trojan Horse story to an array of disciplines and situations. As a concept, it can be used for both good and evil. We live in an era when we are all besieged by marketing messages every moment of the day. Like the Trojans hiding in their city, we have learned to shut these messages out — we use advertisement blockers, throw away junk mail unopened, ignore billboards, and filter out spam emails. In order to gain our attention, marketers often use a technique similar to the Trojan Horse. They offer people an apparent gift — a free ebook, a discount card, a sample. Only once this item has been enjoyed can its real purpose can be enacted. A good heuristic when things seem too good to be true is to just forget about them. Many marketing lessons can be found in the original myth. The Greeks chose a form which appealed to their targets, using a sacred creature and type of wood. Likewise, marketers must fit their gift to the audience, making it appealing to their basic interests. The Greeks used innovative thinking, inventing a tactic which was new and therefore unexpected. If they had tried the same thing again, it would have had no effect. Once a marketing technique is recognizable, its impact wanes. No one is going to click on a “5 ways to kill belly fat” pop-up anymore, or fall for an email from a Nigerian prince telling you just how much money you left there, or enjoy a free executable file that will clean your computer. These ruses are now well known and we ignore them. But when these techniques were new and unfamiliar, huge numbers of people were attracted by the offers. Offering the first chapter of a book for free to people who join an email list — Having read the chapter and received more emails which connect them to the author, people are more likely to buy the full book than they would have been if they had only seen an advert. Creating free high-quality blog content for an audience to enjoy — Once people are interested in the blogger’s voice and expertise, the marketing can begin. Many people will at some point want to support the person whose work they have been consuming for free. This support might include buying courses, books, or consulting services or donating to a Patreon page. We developed the learning community as not only a bunch of extras for people but also a means to support the free content we provide. Writing a book detailing an expert’s specialized knowledge — While sales of the book are often not high, having it published benefits the expert’s business. For example, Ryan Holiday has stated that his books have led to more income from speaking and consulting than from actual book sales. Making the most income from revenue streams which do not appear to be the main objective of a business — For example, high-fashion brands often make more money from perfume than from clothing, cinemas rely on sales of popcorn and drinks, and some restaurants profit predominantly from sales of alcohol. Creating viral branded content which people share and engage with due to its being interesting and often amusing — For example, just try to watch the Android “Friends Furever” video without forwarding it to at least one person. The adorable video wraps up a marketing message, making people more likely to pay attention to it. Permission marketing is the privilege (not the right) of delivering anticipated, personal, and relevant messages to people who actually want to get them. Using permission, Amazon can fundamentally reconfigure the entire book industry, disintermediating and combining every step of the chain until there are only two: the writer and Amazon … Amazon appears to be building a permission asset, not a brand asset. Amazon began by offering cheap books. Once people fell for that initial Trojan Horse, Amazon offered them other products and gradually captured more and more of their online spending. Services such as Prime, Echo, and Kindle are contained within the Trojan Horse — that first cheap purchase someone makes. Just as the Greeks invested effort into building the horse, Amazon has invested millions in technology and infrastructure. This is the essence of Trojan Horse marketing: offering a gift (with Amazon, this includes free trials, discounts, and generally low costs for popular items) and then upselling and upselling and upselling. Like many subscription models, Amazon Prime is a Trojan horse that is expanding the list of products consumers are willing to buy from Amazon and giving the eggheads in Seattle a mountain of customer data to sift through. Let’s say there is a person who dislikes you — a lot. It’s fine; this happens to all of us. But what if you need to form an allegiance with this person? Or maybe they don’t dislike you, they just don’t know you. Either way, you need to build a relationship with them. What should you do? Ask them out for coffee, offer a gift, ask someone for an email introduction? One solution is to utilize the Benjamin Franklin effect, essentially a sort of Trojan Horse approach to building relationships. Having heard that he [a rival who disliked Franklin] had in his library a certain very scarce and curious book, I wrote a note to him, expressing my desire of perusing that book, and requesting he would do me the favour of lending it to me for a few days. He sent it immediately, and I return’d it in about a week with another note, expressing strongly my sense of the favour. We can use Franklin’s technique as a Trojan Horse to gain the respect, friendship, and cooperation of other people. Asking someone for a favor indicates that we already respect them and consider them to have something we lack — a form of flattery which serves as the gift. Once they have accepted this and performed the favor, it can be leveraged. Salesmen use the foot-in-the-door technique. This involves making a small request (for example, filling in a survey), then trying to sell you something. If someone you know has a particular area of expertise, try texting or emailing them (rather than Googling it) whenever you have a related question. One Reddit user on r/LifeProTips recommends texting your mother simple questions on a regular basis to strengthen the relationship. Doing so indicates to people that we consider them knowledgeable, making them more likely to respond to larger requests. Robert Greene also recommends a number of Trojan Horse–style tactics in The 48 Laws of Power, concealing true intentions within a facade and using specific behavior to achieve goals. Use selective honesty and judgment to disarm … One sincere and honest move will cover over dozens of dishonest ones. Open-hearted gestures of honesty and generosity bring down the guard of even the most suspicious people. Once your selective honesty opens a hole in their armor, you can deceive and manipulate them at will. A timely gift—a Trojan horse—will serve the same purpose. When confronted by something difficult or thorny, do not be distracted or discouraged by its formidable outer appearance; think your way into the soft core, the center from which the problem blossoms… Knowing the problem’s core gives you great power to change it from the inside out. Your first thought must always be to infiltrate the center… never to whale away at the periphery or just pound at the walls. Many artists (a term used here to denote anyone who creates something, not just those who paint canvases) have used their work to conceal important agendas. The Beatles, Bob Dylan, and Conor Oberst wrap political and social messages within beautiful music. Bloggers such as Seth Godin and James Altucher envelop key life lessons and paradigm-altering concepts within humorous anecdotes and metaphors. The women who embroidered the Bayeux Tapestry added their own subtle views to the panoramas of war and victory. Companies such as Toms, Ben & Jerry, and Lush use the popularity of their products to fund real change. Johannes Vermeer’s most serene paintings tell complex, taboo narratives. 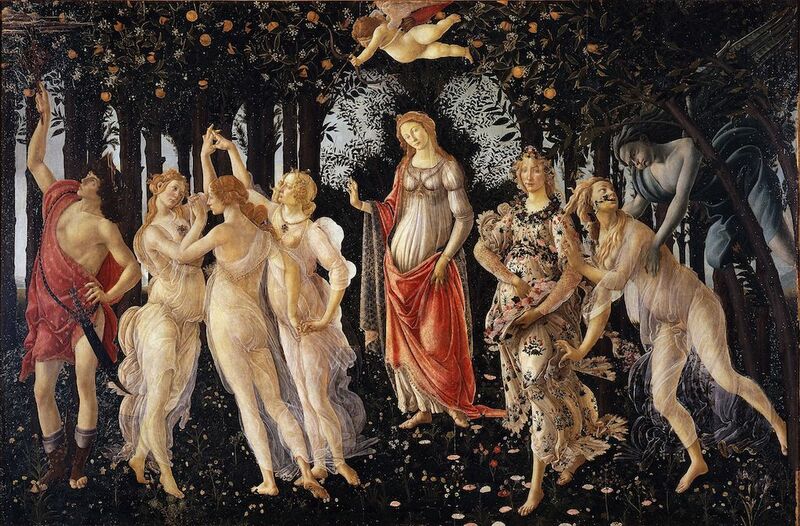 Botticelli’s La Primavera (above) is actually an exploration of his interest in horticulture, not a study of human figures. Consider Gatsby, throwing lavish parties with the sole purpose of attracting Daisy back to him. This is the essence of much of art — an attractive and appealing exterior conceals the true purpose. People use whatever means are available to them to express their views and attitudes. Sometimes this is intentional; sometimes the Trojan Horse is built unconsciously. The purpose is to get a message across in a form which is palatable to people. Few of us enjoy or engage with straightforward expressions of a particular agenda. But when it comes in an interesting form, we pull the wooden horse within the city walls with glee. Just as with marketing messages, we have become desensitized to these sorts of messages. Artists must now use ingenuity and creativity to spread their ideas. The book as a structure is the Trojan horse of art — it is not feared by average people. It is a familiar form in the world, and average people will take it from you and examine it whereas a painting, poem, sculpture, or print they will not. This concept of art as a Trojan Horse is extremely important. Farnam Street itself serves as a Trojan Horse. Our intention is to spread an appreciation of the importance of clear thinking, lifelong learning, making good decisions and living a meaningful life. If upon your first visit to this site, you had found nothing but a list of instructions, the chances are high that you would have ignored it and never returned. Through the use of stories, analogies and careful explorations of important ideas, this agenda has reached and inspired many people. When you read a post about a military tactic or the life of a historic figure, the purpose is not the narrative alone. It is about much more than that — a way of changing how people think. People don’t just share information, they tell stories. But just like the epic tale of the Trojan Horse, stories are vessels that carry things such as morals and lessons. Information travels under the guise of what seems like idle chatter. So, we need to build our own Trojan horses, embedding our products and ideas in stories that people want to tell… we need to make our message so integral to the narrative that people can’t tell the story without it. The Trojan Horse is an artifact that possesses a host of hidden agendas. Rather than presenting a one-off manifestation, the Trojan Horse offers many platoons, capable of strategically addressing the wider culture, pointing to replicable solutions through demonstration. Thus, an artwork acting like a Trojan Horse can contain the seeds of multiple strategic outcomes. In short, when we want to spread an idea or spark change, we would do well to learn from the ancient Greeks. People have strong defenses against anything which challenges their worldviews. By packaging it in a format which appeals to them, we can pass on meaning. Artists, marketers, and politicians (among others) have long realized the importance of this approach. It is a means of injecting our ideas, both good and bad, into people’s worlds through an apparent gift. Trojan Horse Image via PBS.